Coastal waters in the Gulf of Maine are known for their clarity and productivity, and we would like to maintain this precious resource. To do so, it is important to get out on the water and determine the condition of the Gulf’s waters. 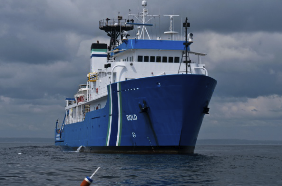 EPA Region New England staff and colleagues last month finished its third consecutive year of sampling waters along the coasts of Maine, New Hampshire and Massachusetts using EPA’s only oceanographic research vessel — the 224 foot long OSV Bold (Figure 1). Figure 1. The OSV Bold plying the waters of coastal Maine in August 2011. Photo: Eric Vance, EPA. The goal of these five- to seven-day summer surveys was to help EPA New England and the Maine Department of Environmental Protection set nutrient criteria for coastal waters. Nutrient criteria are levels of nitrogen, phosphorus, chlorophyll a, and light attenuation (or loss of transparency) that protect specific uses, such as seagrass habitat. These variables are the same indicators used by the Ecosystem Indicator Partnership (ESIP) to help assess water quality in the Gulf of Maine, where between 5 and 10 percent of coastal waters have elevated levels of nitrogen or chlorophyll a and losses of seagrass habitat, from many causes, have been observed in many estuaries.1 Seagrasses, specifically the eelgrass Zostera marina in New England are especially susceptible to shading by suspended algae (phytoplankton) or crowding out from other forms of algae growing on the seafloor or on its leaves. Because population growth and increases in development bring more nutrients from sewage and stormwater runoff to coastal waters, we must continue to monitor water quality conditions, and determine levels of nutrients that protect our waters and coastal habitats. In 2010 and 2011, we characterized nutrient conditions in bays that ranged from relatively unimpaired, like Wells Bay in Maine, to potentially impaired, like Salem Sound in Massachusetts, where seagrasses have declined by 70% between 1996 and 2006.2 In 2010, we sampled 22 stations in seven coastal bays, and in 2011, sampled 26 stations in six bays, multiple times (Figure 2). Figure 2. Stations sampled in August 2011 on OSV Bold. We sampled coastal waters using a Seabird CTD (conductivity temperature and depth sensor) surrounded by a “rosette” of six 10 liter Niskin bottles (Figure 3). The CTD included additional sensors for chlorophyll a and a PAR (photosynthetically active radiation) sensor to measure light attenuation. At each station, water was sampled at three depths, and processed for laboratory analysis of total nitrogen, phosphorus, and chlorophyll a. Figure 3. 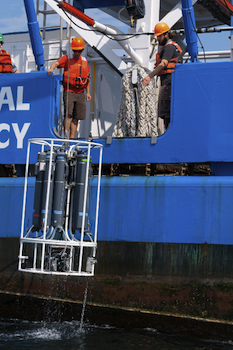 Sampling coastal Maine waters with the OSV Bold CTD and rosette, August 2011. Photo: Eric Vance, EPA. 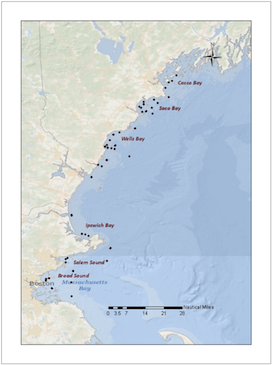 Preliminary results (Figure 4) showed some bays, such as Broad Sound and Salem Sound in Massachusetts, and Penobscot Bay in Maine (not sampled in 2011, and not shown in the graphic below), with elevated levels of nitrogen or chlorophyll a. Figure 4. Average concentrations of Active Chlorophyll a (ug/l) and Total Nitrogen (mg/l) in six bays sampled in August 2011, multiple times within the five day period. Averages include surface, mid-depth and bottom samples. Chlorophyll a in green, Nitrogen in red. 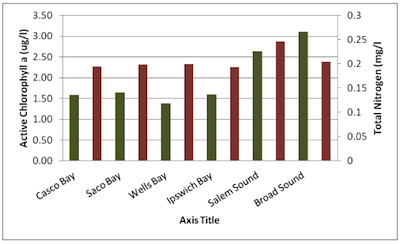 Of course, these bays differ in residence time and typography – Penobscot Bay presents rocky coasts with interspersed islands, while Wells Bay is more open and bordered by long sandy beaches. These factors will be evaluated as we consider the next steps in determining levels of nutrients appropriate for protecting waters off New England’s coast. By the end of 2013, EPA will have analyzed all the data and prepared a report which will recommend levels of nitrogen and chlorophyll a, and perhaps light attenuation to protect this area’s coastal waters. Results from a more in-depth study conducted in 2012 in Salem Sound in coordination with a local watershed organization, Salem Sound Coastwatch, will also be released. 1 Liebman, M. Benoy, G., Latimer, J.S. and S. Bricker. 2012. Eutrophication: State of the Gulf of Maine Report. Gulf of Maine Council on the Marine Environment. 2 Charlie Costello. 2009. Twelve Year Mapping and Change Analysis of Eelgrass (Zostera marina) Distribution in Massachusetts (USA) Identifies State Wide Declines. Presented at the Status, Trends, and Conservation of Eelgrass in Atlantic Canada and the Northeastern United States. February 24-25, 2009. Portland, Maine. Not all declines are caused by nutrient enrichment.